Valencia Pride mangoes are a “Technicolor sunset” hue. Saturday, 10am – 12 noon: Sweet salad mix, limited amounts of microgreens, dragonfruit, passionfruit, papaya, mint and lemongrass. 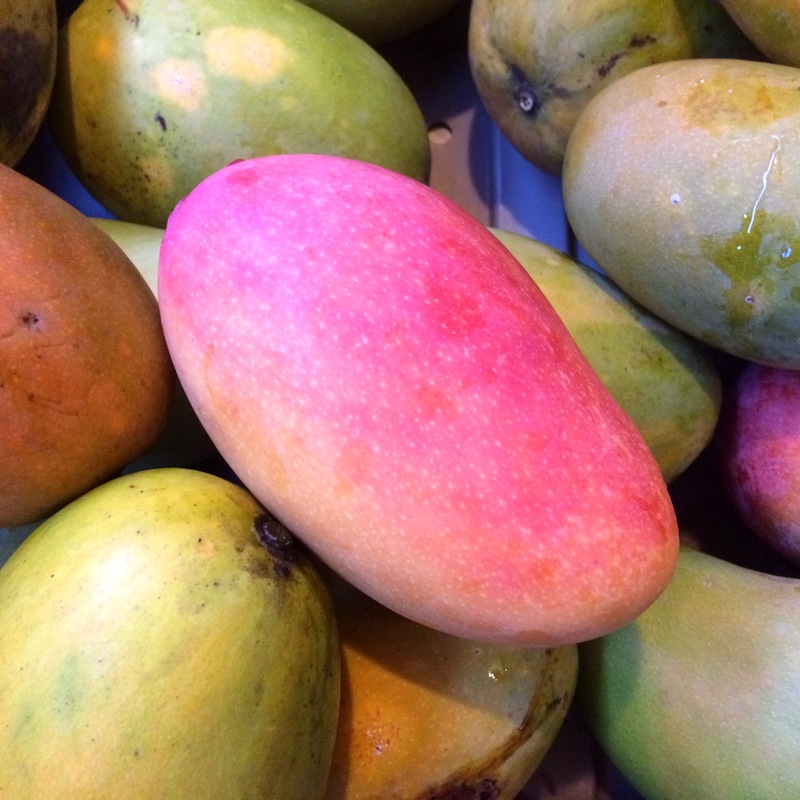 From our partners we have a varied selection of top mangoes including Nam Doc Mai, Madame Francis, Valencia Pride and Haitian Kidney from Dennis Nash, Viequen Butterball mangoes from Tita, and vegan coconut ice cream from I-Sha. We heard you could smell it in Frederiksted. 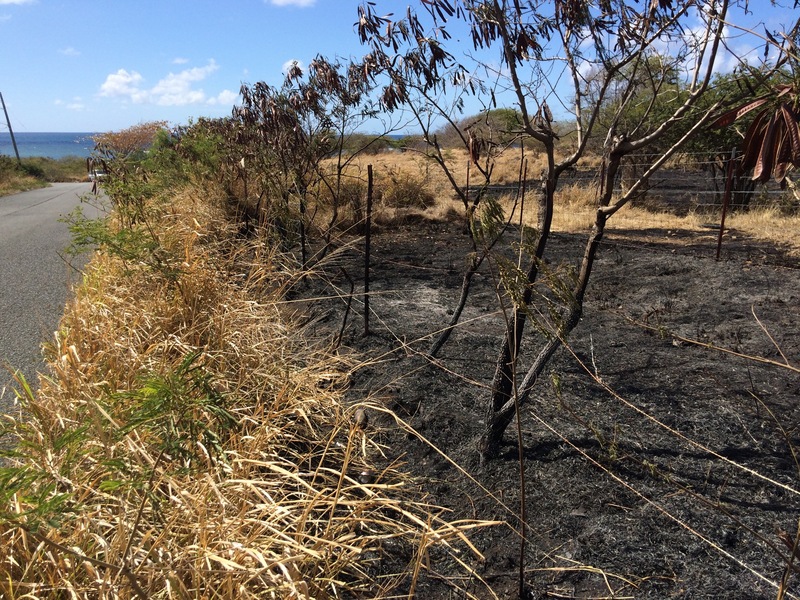 Dozens of acres of bull pasture that are part of UVI’s Senepol cattle operation burned early Monday morning, right across the road from ARTfarm. The fire was started by vandals who stripped a stolen pickup truck and then set it on fire halfway up Spring Gut Road’s south side at 3 AM. Looking north from the road near the ARTfarm entrance, Monday’s reignited brushfire is seen here progressing west. Note the blackened hillside east of the smoke. 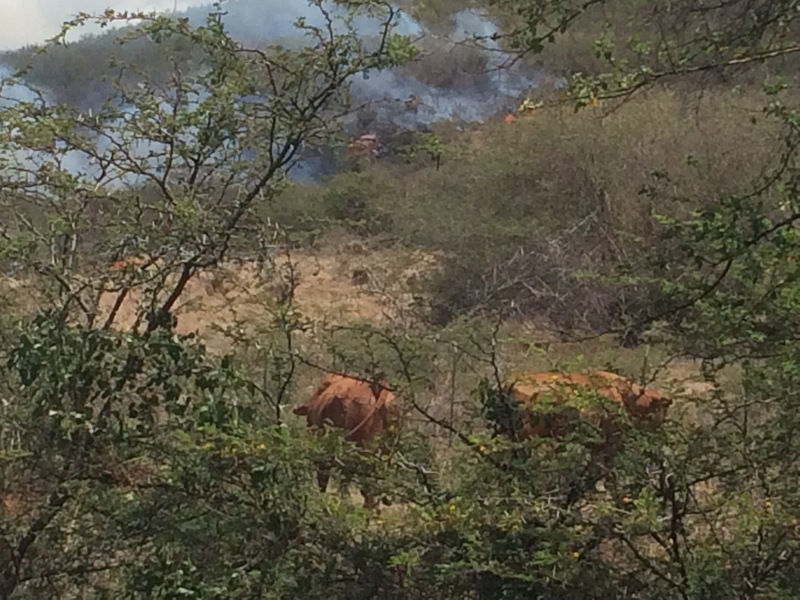 The blaze quickly spread west across the arid pasture. The VI Fire Service was on the scene by 3:10 AM and managed to extinguish most of the blaze by around 7:30 AM. It reignited soon after and burned all the way to Many Paws Road with flames up to 20′ visible from the South Shore Road, destroying more pasture forage, threatening nearby homes and our neighbor’s sheep pastures. VIFS returned and battled the brushfire again, putting it out again with the assistance of a sudden and very welcomed rain shower that arrived about an hour later. Can you spot? 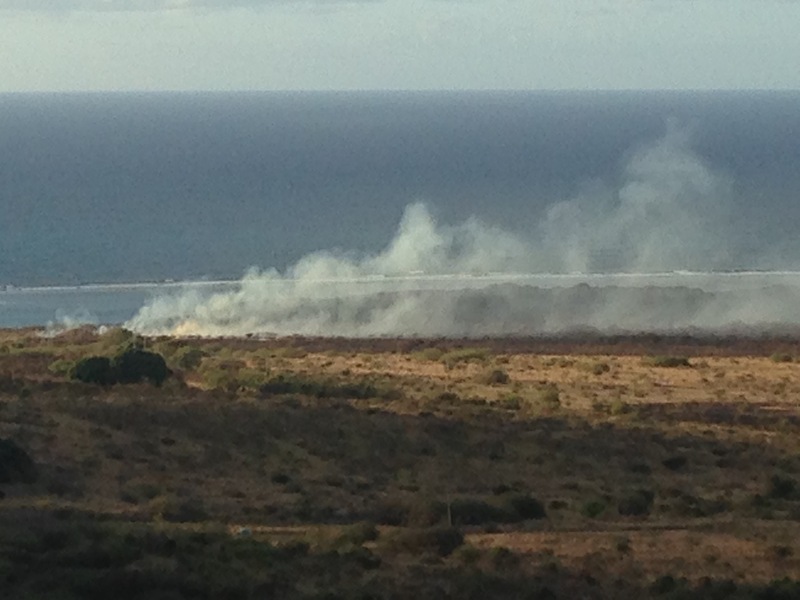 A fire truck surrounded north and south by blazing pastures? Fire crawling up the hill toward houses? Two Senepol bulls being pushed into the next pasture by UVI cattlemen? A patch of flames much closer to the bulls? At times the grey and yellow smoke was so thick you could not see to move a vehicle. A clearer image of the firetruck up in the bush. A team of firefighters were working to extinguish the north head of the fire that was moving toward homes up the hill. Arriving just behind this 3,000 gallon pumper truck: well-timed backup from Mother Nature. The dark clouds approaching from the east brought a brief but heavy rainshower that helped to extinguish the blazing pastures. 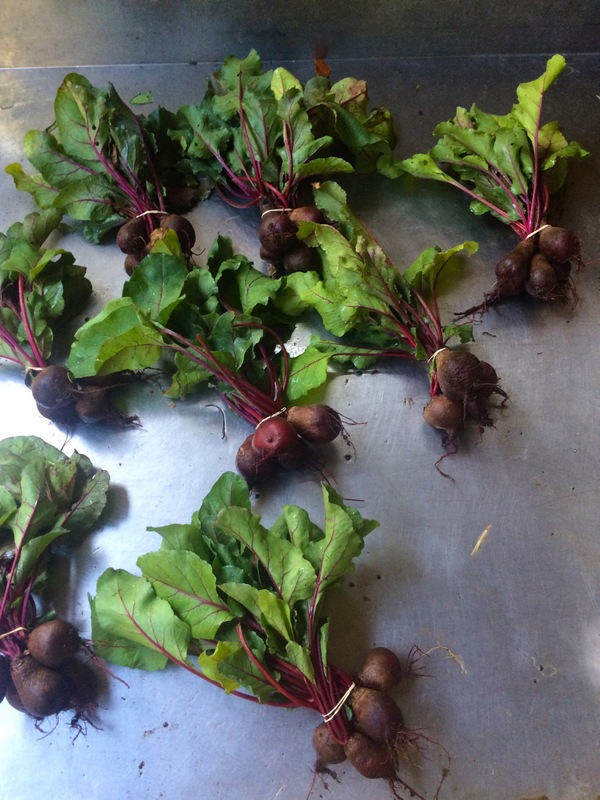 Big beautiful beets at ARTfarm. 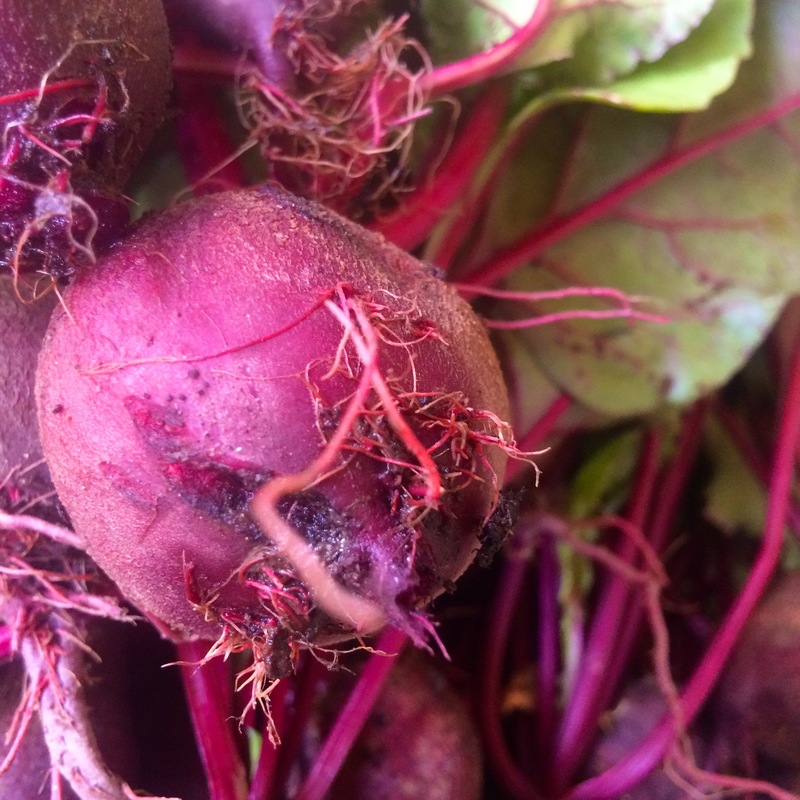 The tops are great in your green juice, as a cooked green, wilted over eggs… chopped into your salad… don’t neglect the beet greens! 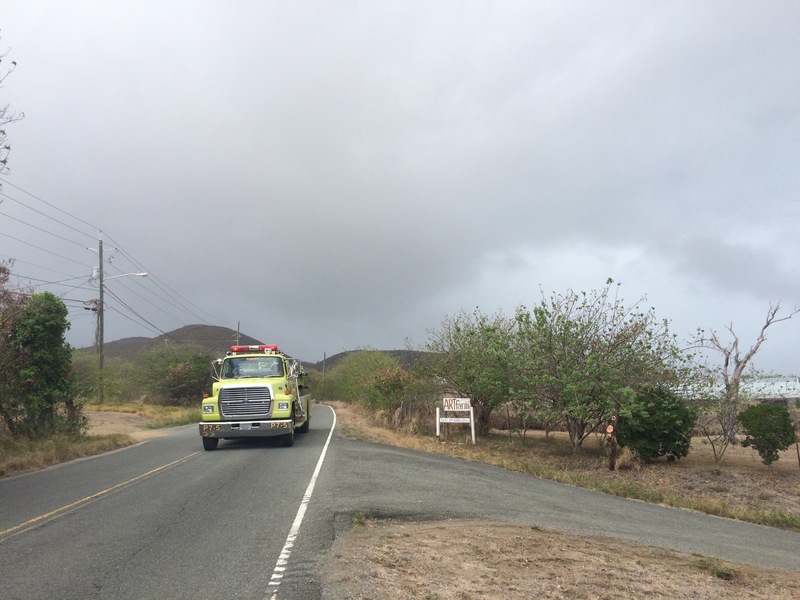 Our thanks go out again to the VI Fire Service shifts C and D out of Richmond/Christiansted, with trucks from Grove and East End, and VIPD for coming back to Longford a third time this week. Tuesday evening’s fire flared up again on Wednesday afternoon, sending out a new fire crew headed by Captain Henry Joseph; it continued on its previous trajectory toward the beach and burned over a hundred acres of pasture and fencing belonging to our neighbors and killed another cow on Wednesday. A second blaze was set in ARTfarm pastures about 3/4 of a mile away from the initial fires just before 8pm Wednesday night at a curve in the road where the streetlight is out. 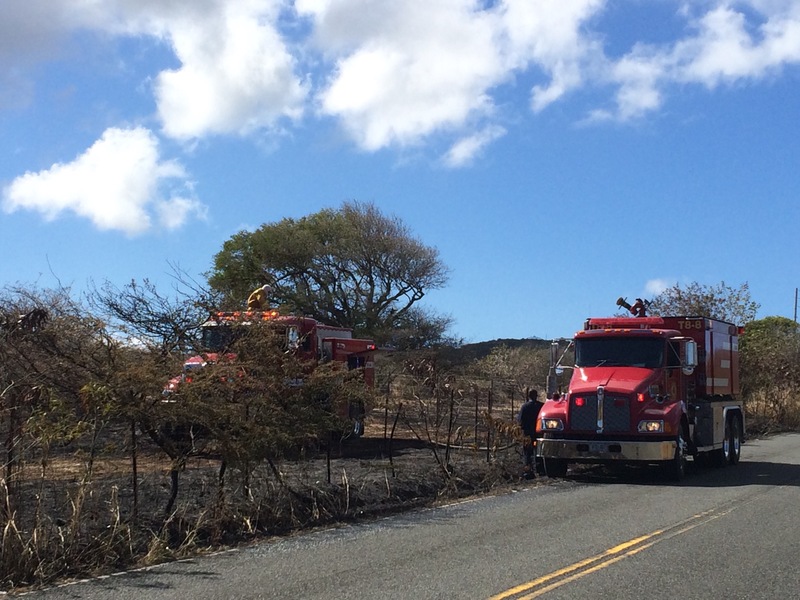 We had a number of people offer help again and had a crew of employees, customers and fellow farmers on hand to move sheep, manage gates and direct the fire trucks. It was dark and smoky, and we were too busy to take pictures, but it was an incredible scene. After the Captain Joseph and his VIFS team departed for a second time with the trucks, Luca and a neighbor we’ll call “Water Mike” were out containing and extinguishing smaller fires until 2am Thursday morning. Our neighbor who took these pictures acted as our fire tower during the fires and helped us locate problem areas from a higher vantage point. Wednesday afternoon. This image captures Wednesday night’s situation; the rekindled original fire headed south to the beach, and in the foreground the second fire started a mile away up on South Shore Road on ARTfarm pasture. 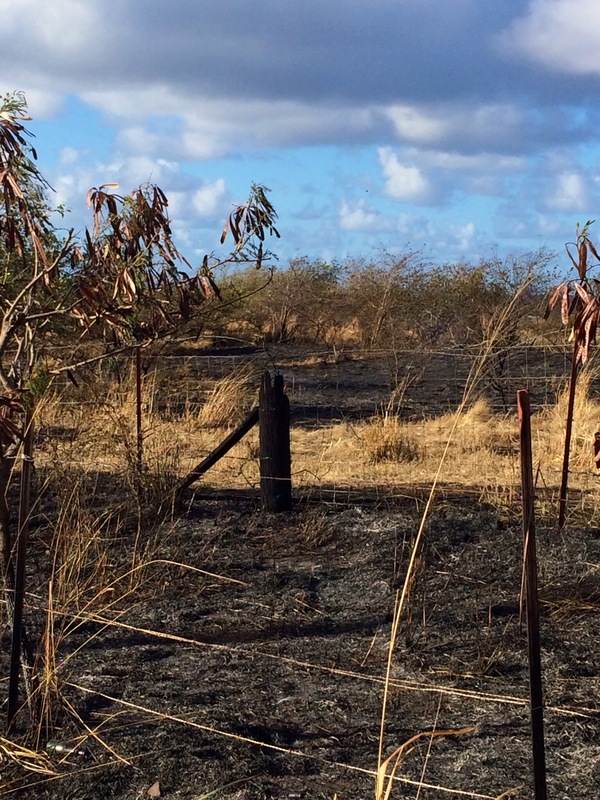 By Wednesday afternoon, the original fire had rekindled and burned south throughout the day across the pastures toward the beach, killing one cow. It burned eastward along the beach through Thursday morning, when the Fire Service came back and extinguished the spread. VIFS pumper trucks from Richmond C shift, East End and Grove Fire Stations helped us out Wednesday afternoon, and came back Wednesday night to assist with the new roadside fire. We’d appreciate brushfire awareness from all of our customers. Please never throw cigarettes or other burning material from a vehicle; do not allow chains on trailers to drag on the ground; and keep a neighborhood watch. If you see someone stopped on the side of the road, slow down and offer assistance; if suspicious, snap a picture of the vehicle and license plate. And share this information with others in the dry season. We thank you! We are open 3–6 p.m.! Today we have sweet salad mix, spicy salad mix, a few cucumbers, Bodhi beans, onions, beets, Italian basil, Thai basil, lemon basil, cilantro, cherry tomatoes, slicing tomatoes, heirloom tomatoes, and a few more fresh figs. 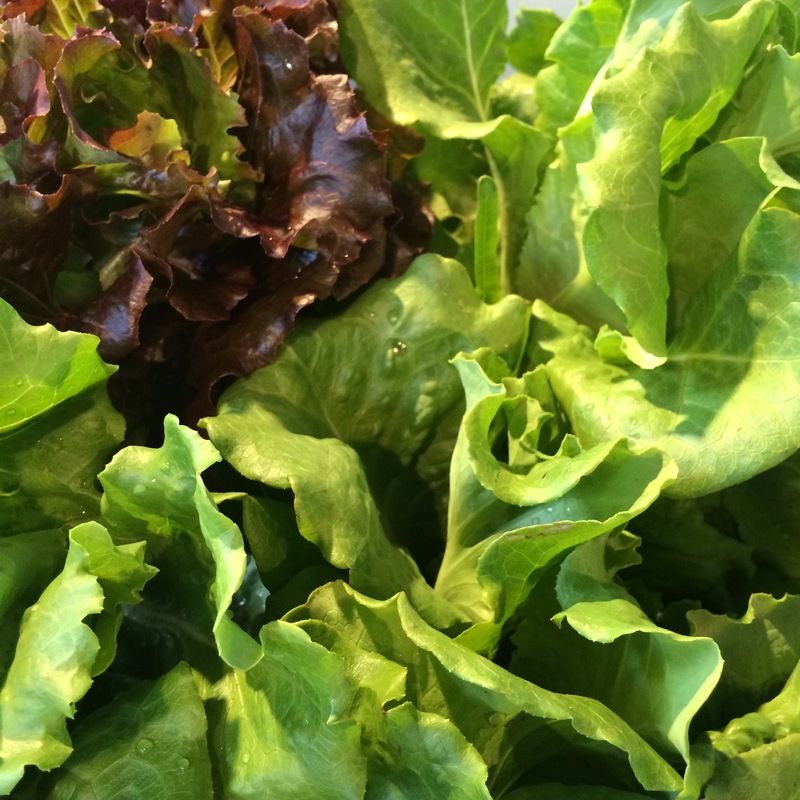 Beautiful ARTfarm salad greens for the sweet mix! Farming is certainly a round-the-clock exercise. 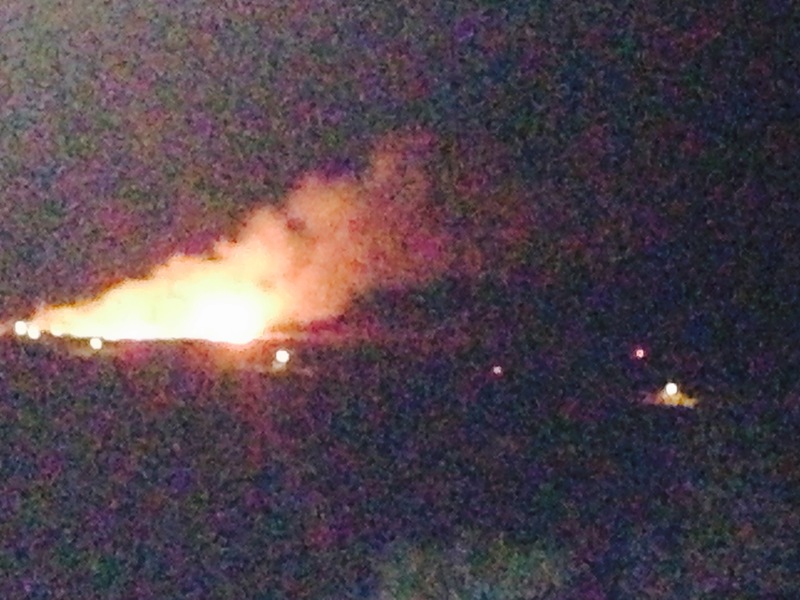 Last night around 9 PM we smelled smoke and saw flames shooting up into the sky on the east end of the farm. Luckily we had fair warning as Luca was out watering late and noticed it quickly, shortly after hearing the sound of voices along the east roadside. Neighbors in the area also alerted us to the brushfire and offered help via text, calls and Facebook. We quickly moved our child to grandma’s, suited up in protective clothing, grabbed our fire flappers and other firefighting equipment and went to move sheep and equipment out of harm’s way and help the neighbors wherever possible. 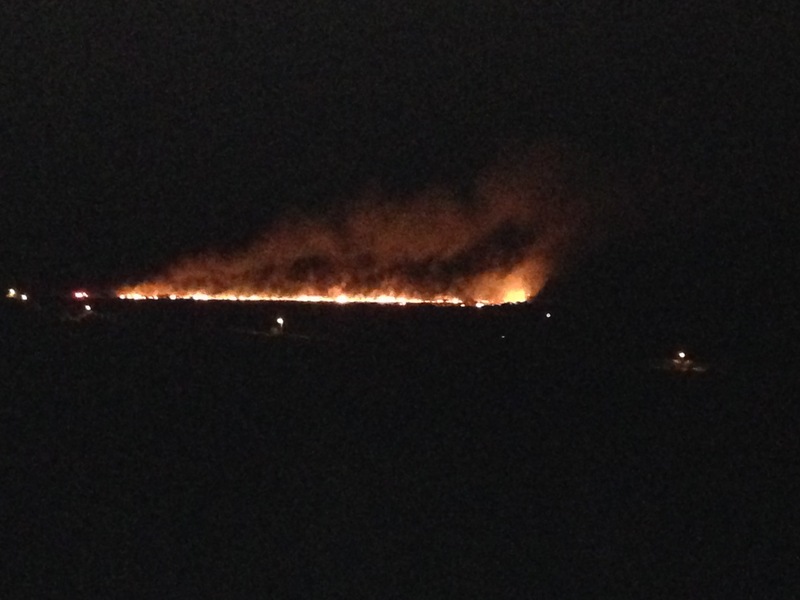 A view of the brush fire last night from the top of Spring Gut Road looking south, via a neighbor. 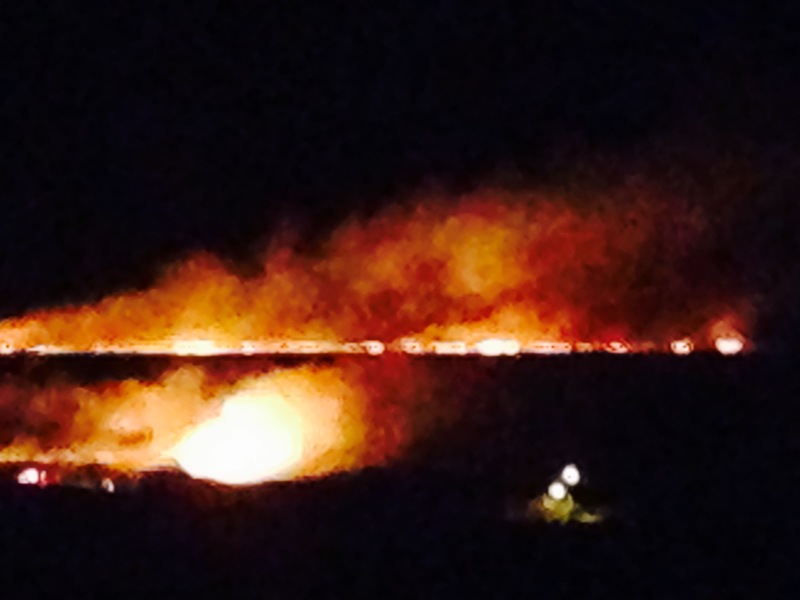 The fire moved across the pasture from east to west. The large yellow lights along the center of the photo below the fire are streetlights on South Shore Road. The red light on the right side is a VIFS truck. The small squarish light near the center right of the photo is us in our truck in roughly the center of ARTfarm. From our angle in the pasture it appeared that the fire was advancing rapidly toward us and a small group of young cattle. Luckily there was not a strong wind last night, and conditions coupled with a rigorous effort by the VI Fire Service on all sides contained the fire and prevented it from destroying hundreds of acres of pasture in use, as well as cattle and sheep, wildlife, farm infrastructure and the homes of farmers including us! Another shot of the fire as it continued to spread and head south. Our truck is the tiny pinpoint of light close to the west end (right) of the fire line. Above us and closer to the fire is a VIFS truck. 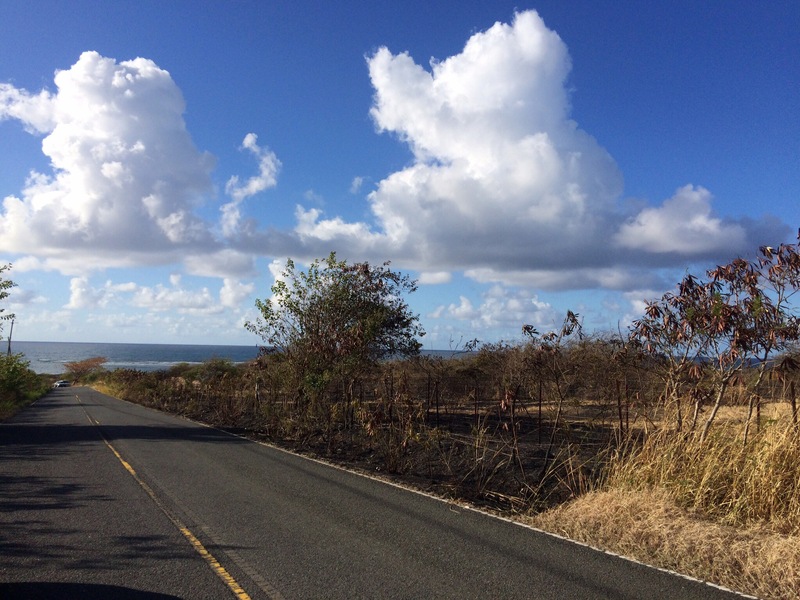 We spoke with Captain Charles Gilbert, Fire Service officer out of Richmond/Christiansted’s C shift, who was in charge of the operation last night. They had a total of six VIFS trucks on the scene, but it felt like a lot more to us, as they continued to contain the fire from 9pm to 1am. These included trucks from the East End, Richmond, and Grove stations. The only casualty of the evening was a young calf that got onto the road (due to gates left open to allow emergency access) and was struck by a passing vehicle. Some fencing was damaged and will need to be replaced. Fence damage. This wood post will have to be replaced. 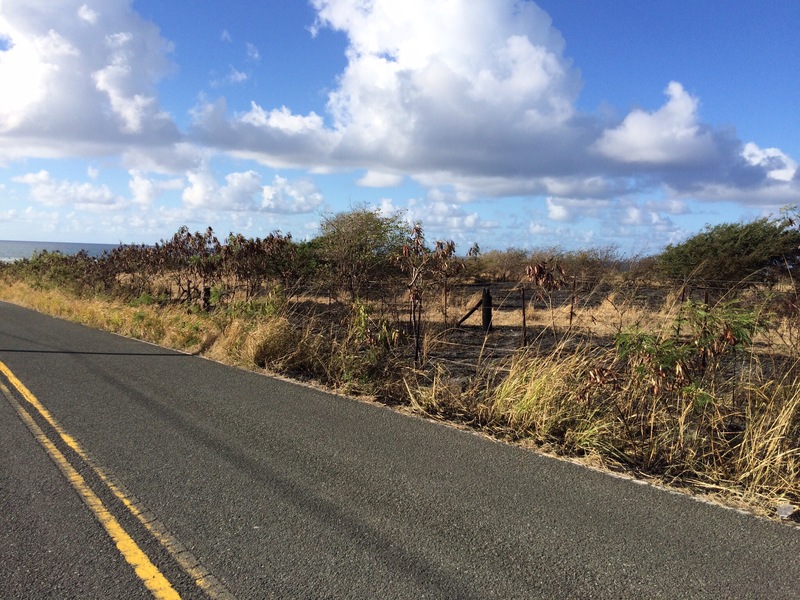 The steel t-posts, woven wire and barbed wire materials have a much shorter life and rust much faster after being burned in a brush fire as it tends to remove their protective coatings of paint or zinc and weaken the metal. We are extremely grateful for the prompt and thorough response from the VI Fire Service last night. We plan to drop off some tomatoes to Captain Gilbert and his C company team, and we’d love it if you’d thank them on our behalf, too! Looking south along the fence near the east end of the farm. 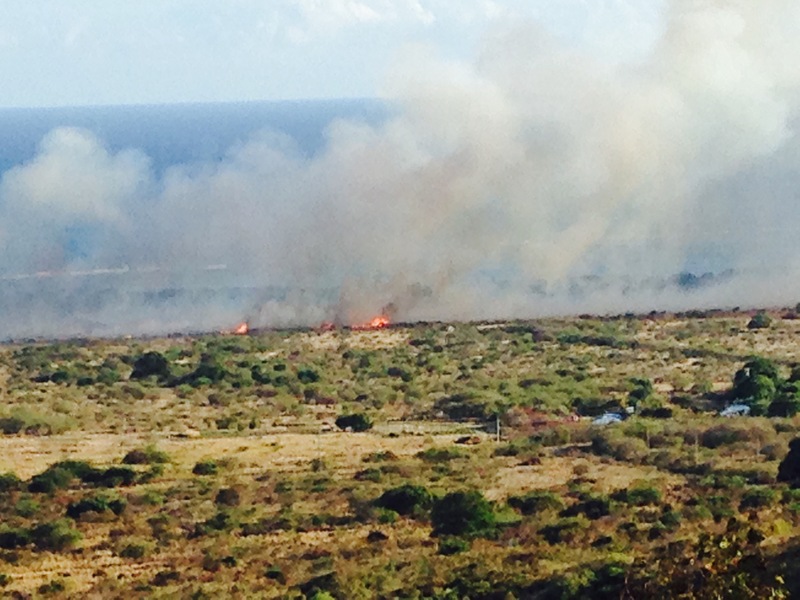 Evening brush fires are most likely deliberately set, according to officials at the VIFS. The fire started near the roadside, then jumped across a ten-foot swath of grass and headed west southwest through the pastures. Left unchecked, this could have been disastrous for us! Looking south near the east end of the farm. 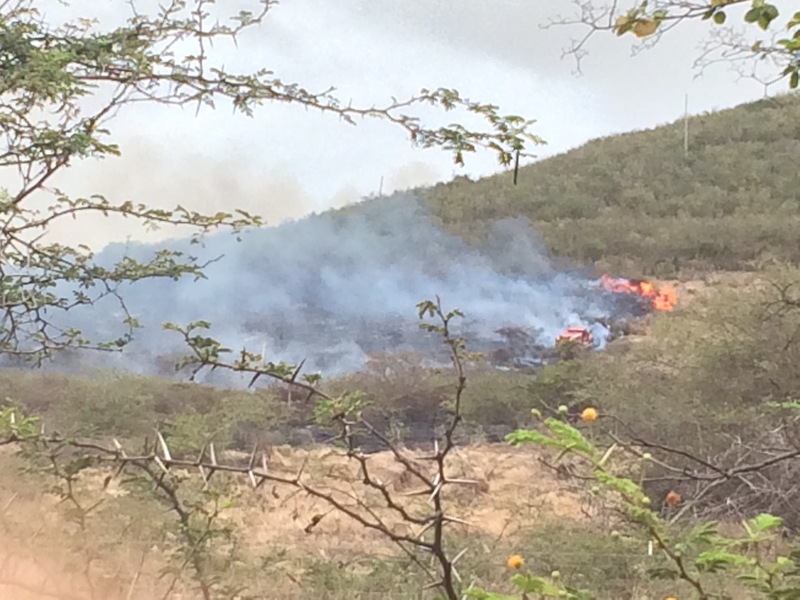 The VI Fire Service was able to contain and control this brushfire, in part because winds were not strong.